A new year means a whole new onslaught of security threats that your network security must combat. Like their organic counterparts, computer viruses evolve–they learn and grow every year, becoming more sophisticated, complex, and sneaky. These new security threats are nothing like those your network faced last year: they are a whole new species, ready to evade some of the most sophisticated firewalls and security systems available. 2017’s newest threats to your network security are profoundly damaging. Now more than ever your network security is vital. Now, your network solutions must be effective–now, your network security must be truly secure. So call your IT people and get that network assessment, tell your coworkers to change their passwords, and don’t forget to reboot your laptops every-so-often–these are the top 7 threats to your network security in 2017. Malware has been the definitive attack method of cyberattacks in the recent years. In fact, malware has been so prevalent that most antivirus products have actually been deemed ineffective. Malware itself has evolved faster than malware defense. With each new installment of malware, malware security is outdated tenfold. The malware of 2017 can now reside in the memory of your computer. This nesting malware ransacks your network from within your own computer. 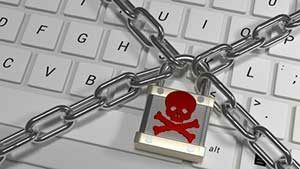 This new malware, however, cannot survive a simple reboot–still, this has not stopped the malware’s spread as most users seem to forego rebooting their computers. Workers are often satisfied with their laptops and computers slipping into “sleep mode,” and sometimes mistake “sleep mode” for rebooting. In the modern working world, laptops and cellphones and tablets have grown more prolific, becoming an intimate part of our everyday work. These, too, invite malware into our network. Malware residing in the memory of our computers and laptops is incredibly difficult to detect, and because we don’t reboot our systems frequently, they linger for a longer time. When we use other devices (like tablets or cellphones) to remotely access the information in the infected-memory, the malware spreads. The malware itself can even spread from cell phone to computers via the shared wifi network. Sneaky, sneaky. Once an infected device connects to the business’s wifi, all systems are compromised. And this isn’t even Malware’s final form. When it comes to the ransomware of 2017, you’re going to need more than Liam Neeson’s “particular set of skills” to get your data back. Ransomware is when hackers infiltrate your computer or network, encrypt your files, and then hold the data hostage until payment has been extorted. The latest ransomware can not only hack your system more profoundly but it can also infect hundreds of machines at a time. The ransomware of 2017 has the capability to lock out entire small businesses and completely freeze up full departments of big businesses. This new ransomware is spread between users like the common cold. Instead of targeting a singular source, the ransomware infects then germinates, causing a chain reaction of infection. As one hacked machine interfaces with another, the ransomware spreads. Often, ransomware cloaks itself in mundanity to surpass your network security: it arrives unassuming as an email attachment or a shared link. Once the email has been opened, or the link has been followed, the ransomware has invaded. Be cautious when opening suspicious emails or clicking funky links: you don’t want your important data to be taken or held for ransom. The ever-omnipresent Internet of Things (IoT) is the web of interworking devices connected across a shared network. The IoT can be a small office-wide connection of computers via a shared network, or a large world-wide connection of devices via cloud computing. This intimate interconnection of devices allows data and information to be exchanged with greater ease, increasing accessibility for workers and streamlining business functions. For instance, with the IoT a worker can remotely access all of their files from any compatible device. With the IoT, businesses can even have their software update and integrate automatically. 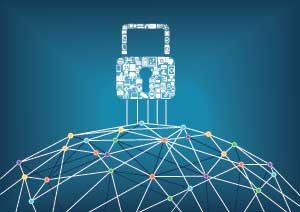 Though the IoT may streamline and optimize business functions, it makes your network security more vulnerable when it is not adequately protected. In today’s working world, the IoT has spoiled businesses with amazingly advanced connectivity, immediate communication, and streamlined organization. Enjoying the functionality and convenience of the IoT, we can be willingly blind to the glaring weaknesses of the IoT that threaten our network security, the most threatening of which is DDoS attacks. Distributed Denial of Service (DDoS) attacks exploit the connective network of the IoT. With a DDoS attack, multiple hostile systems overwhelm the bandwidth of the targeted network. All services connected to the targeted network are stalled, causing widespread disruption that overloads the system and threatens a severe disaster that can result in total data loss. DDoS causes total, impenetrable network blockage. Any web of network-connected devices are vulnerable to DDoS attacks, from business networks and home networks to government networks. Your network security is vulnerable to two kinds of insider threats: malicious intentions and user error. Both can be avoided simply by improving worker communication. Malicious insider threats seek to sell information or provide access to company networks. Monitoring user activity can help identify a worker who is actively seeking-out company data and information for personal profit. User error, however, is the greatest insider threat to your network security. Workers simply forgetting to logout or reboot their devices render networks vulnerable to a wide range of malware and ransomware. Stale passwords and weak passwords also weaken business network security. Keeping security updated and functioning includes making sure workers exercise proper account maintenance through strong passwords that are changed frequently. Artificial Intelligence (AI) is not just a part of our smart devices and the terminator. AI has become integrated in 2017’s newest viruses and malware. These new security threats are semi-sentient: they learn, they grow, and they adapt. So as our security adapts and tries to mitigate our weaknesses, the viruses and malware evolve, too. They learn how to spot weaknesses, circumnavigating security. They watch repetitive actions and exploit patterns. Businesses whose IT is not professionally maintained or monitored are especially susceptible to machine learning-enabled attacks. One does not simply bump into great cybersecurity professionals. In fact, in recent years the demand for better network security professionals increased by a whopping 80%! Many businesses are not working with competent, qualified security professionals. Businesses who are unfamiliar with their networks and infrastructure, and those cutting corners with their IT maintenance, are the most vulnerable to network security threats. Businesses who invest in outsourced IT or IT consulting for their network security are at less of a security risk because security is being managed, updated, and monitored by trained and experienced professionals. 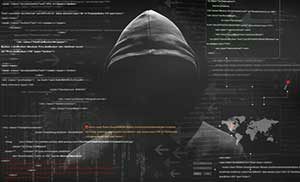 In 2017, hackers will take advantage of known weaknesses and exploit business’s false sense of network security. Almost 25% of hacking incidents are done through the exploitation of known weaknesses and are completely (and easily) preventable. Making sure your company is working with qualified network security professionals can dramatically decrease your risk of network security threats. Investing in professional network assessments will greatly improve your network security. Because security threats are growing more rapidly every moment, falling behind on updated security can increase threats and ramifications exponentially. If you are a part of a small business or a mid-sized business, you will almost certainly be targeted in 2017. Most experts say its not a matter of “if,” but rather “when” it will occur. In the last year, 75% of small and mid-sized business suffered network security threats. Smaller businesses are targeted because they often do not adequately encrypt their sites or support their network/infrastructure with proper IT services. Smaller businesses often do not have in-house IT support, and sometimes they do not retain effective outsourced IT support. Smaller businesses are also susceptible to outdated security and ineffective authentication systems. To best combat the innumerable network security threats of 2017, small and mid-sized businesses should pursue effective, professional network assessments and managed IT support.